Here is what I have heard the schedule is like for the Ninth Day, October 6th. 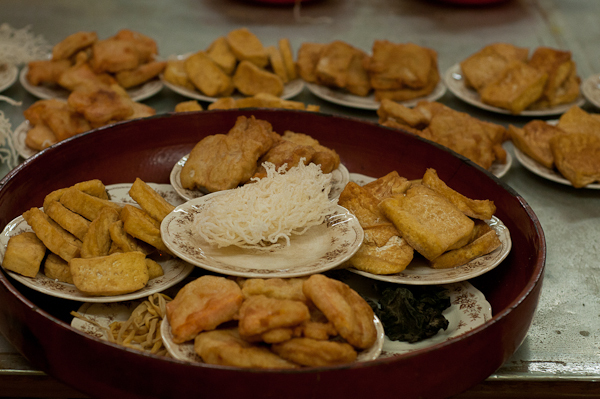 There will be quiet prayers to the Emperor tonight, Day 8, with special offerings of fruit and food that the Aunties are preparing right now. Tomorrow (Day 9) the day will be busy with preparations for the evening rituals – cleaning and sharpening the swords and skewers that the mediums will use, moving the float out to the middle of the street, building the Passageway of Safekeeping. Many devotees will come to Hong Kong St to pay their respects to the Emperor and pray for the health and prosperity of their families. At about 7pm, the Passage of Safekeeping will be ready in front of the temple and devotees will be invited to cross through the doors, as a cleansing ritual. 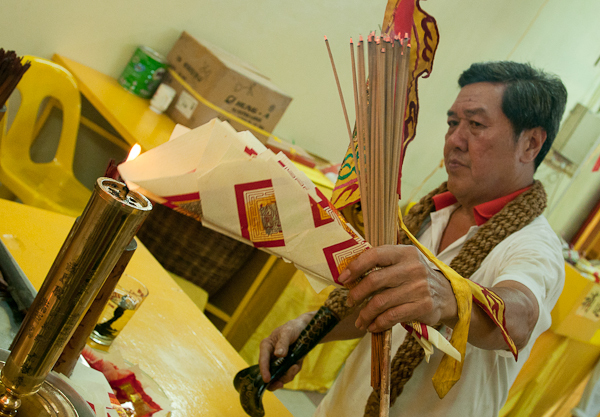 At about this time, the god (most likely Tiong Tua Guan Suai) will be invited to the temple and, all going well, the other gods will follow. At this point (8pm? ), the mediums from other temples will start arriving and pay their respects to the Emperor, before entering trance and calling the gods. We can expect somewhere around 15 mediums at Hong Kong St temple. At the same time, floats from other temples in the area begin assembling on Lebuh Chulia, at the end of Hong Kong St for the procession. These are non-Nine Emperor God temples that are showing their respect and support for Tow Boh Keong, Hong Kong St. At latest count there are 18 temples joining the procession. At 10pm the procession will start to move. 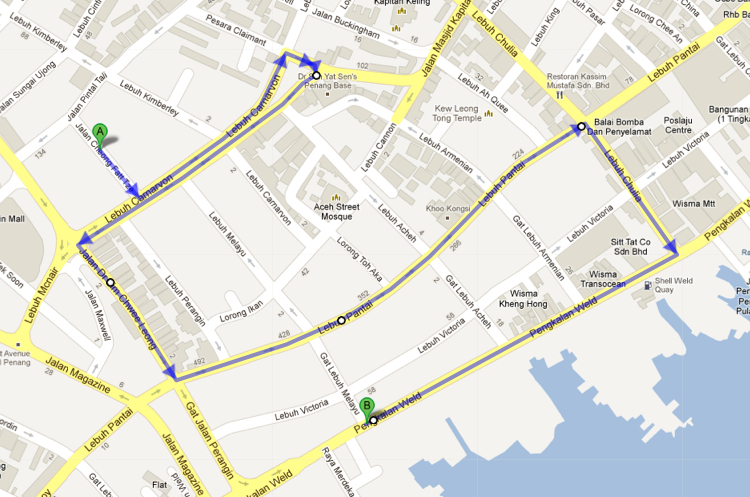 It takes about an hour and a half for the procession to follow the 2.5 km route and arrive at the Yeoh Jetty. Here is the route: Hong Kong St (also known as Jln Cheong Fatt Tze) to Lebuh Carnarvon, where they make a big u-turn and come back past the temple. Then they turn left of Lebuh Dr Lim Chwee Long for a short distance. The next turn is left onto Lebuh Pantai, for a few blocks, then right on Gat Lebuh Chulia, then right on Pengkalan Weld and along to Yeoh Jetty. The Tow Boh Keong banner and the VIPs will lead the procession, followed by the participating temples, and finishing with the Tow Boh Keong contributions, including Tow Pek Gong, the ceremonial boat, the yellow boat and the large float carrying the urn of the Emperor. On Lebuh Carnarvon, there will be a time when the procession is on both sides of the street – double the excitement! At the intersection of Lebuh Dr LChL, there is potential to intersect with the procession of the McCallum Rd temple as they head down to the jetty. Along Lebuh Pantai there will be altars set up by families and businesses along the sides of the road and the mediums often pause there. As we cross Lebuh Melayu a medium from the temple comes out to pay respects to the Emperor and the other gods as they pass. As the procession turns on to Pengkalan Weld from Gat Lebuh Chulia there is the potential to meet the procession from the Burma Rd temple as they move to the jetty. It has been suggested that the Monkey god could help us be everywhere and do everything as he can split and become many – a whole army in fact! Good guy to know. 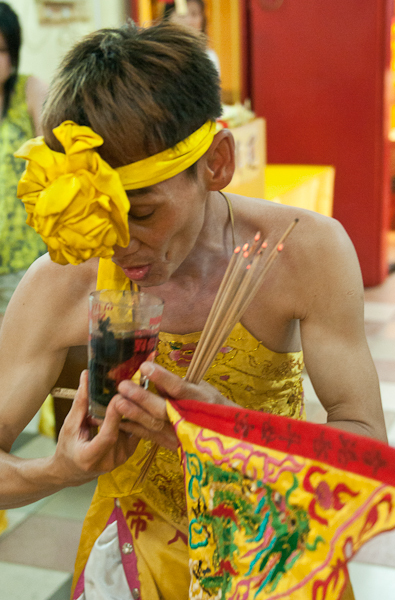 Stay connected to what's happening at the Nine Emperor Gods Festival. Enter your email address to follow this blog and receive notifications of new posts by email. Cheryl is a freelance photographer and writer, and a good friend of the Nine Emperor Gods Temple in Ampang.